*sigh* So yesterday i get home from work and Our yellow star had decided that our powerhead needed a good cleaning and made his way to the top of the tank to get to it....However when i found him he was completely wrapped around it and looked like he was being sucked in the "in" part of the water jet thing (forgive the terminalogy its different from our other 2 powerheads so im not sure about it, It would be the thing we use to pump water in and out of the tank.... current machine?) Either way we got him off safely without prob. but he looks seriously hurt. I took a couple shots to share but its night time in our tank rite now so there not the best ! He has since uncureled his self and moved about 2 -3 inches so we know hes not dead, Just wondering if he will make it ? hmmm... Forgive the pics they really don't do much justice. The white part that you can see looks to be like scar tissue and not his underside. I can see some of his tiny tentacles still moving but a lot of him is closed up tight. I just went to take a peek and he has since moved closer to the rock, seeking shelter I assume. Ok so day 3 and hes made his way to the back of the tank to hide and heal I assume. I think he will make it ! if you don't see any signs of him melting he may just make it. I haven't had much luck keeping starfish. hmmmm.. time to open another poll. Minus a bit of scarring on a few limbs he seems nice and healthy!!! P.S. Humans should learn regenerative concepts from sea creatures. Wow! 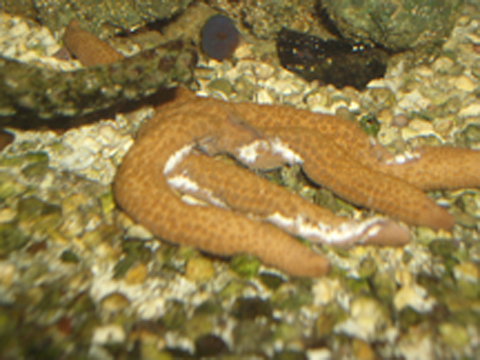 It's been a while but our yellow star fish has re-surfaced. *YAY US*! Congrats, you must be doing something right. We are trying, there is much research being done to understand how they do it and how to apply it to humans.